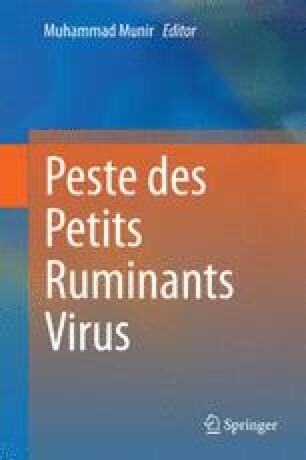 Peste des petits ruminants (PPR) is a contagious disease with potential for high economic impacts. Convalescent and vaccinated small ruminants develop a strong and lifelong immunity and are fully protected against re-infection. Consequently, the presence of antibodies, whether they are against a wild virus or a vaccine, is a marker of the host immune protection. Thus, specific antibodies cannot be missed with classical and validated diagnosis assays, such as conventional enzyme-linked immunosorbent assay (ELISA), an alternative testing method to the conventional virus neutralization test (VNT), allowing to monitor vaccination or locate disease outbreaks. Recent insights into the virions’ protein composition, development of expression systems, recombinant vectors to express protective antigens, have contributed greatly to update our current knowledge about diagnostics. In the light of this progress, the chapter focuses on PPRV serological tests with particular attention to diagnostic antigen targets and refinement of assays for accurate serodiagnosis of PPRV. The author wishes to acknowledge all members of the virology group at CIRAD, particularly Olivier Kwiatek, that have generated diagnostic data relating to PPR serology, as well as countries that have submitted samples to the Reference Laboratory. I also acknowledge Dr Emmanuel Albina for editing and commenting on the manuscript and Mrs Denise Bastron for assistance in the figure design.